Normal healthy, young eyes can focus from far in the distance to just a few centimetres from the eye. This is because the lenses in young eyes are very flexible and can change shape to focus on different things. This happens so quickly that we don't even know our eye is refocusing. As we get older, the lenses in our eyes thicken and slowly lose their flexibility, making it difficult to see things that are very close to our eyes. Around the age of 40 to 45, things become very blurry at our normal reading distance. We have to hold print further away to read it. 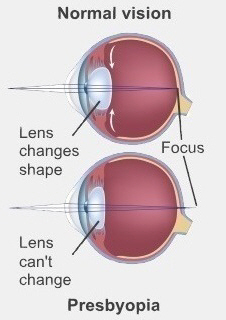 This loss of focusing ability is called presbyopia. It is not a disease, but a normal change that affects everyone. Presbyopia doesn't happen suddenly and it doesn't affect your distance vision. The process that causes presbyopia starts in adolescence, and we can't stop it. a need for brighter lights when doing close work. If you notice any of these symptoms and you are 40 or older, you probably have presbyopia. The symptoms will continue to get worse until around age 60. On the next page: How is presbyopia treated?